On the more flat terrain the rocks are often covered with a thinner or thicker layer of soil. On these places one can find heath or bushy vegetation. In these types of vegetation, Bornholm is known from species as Sorbus intermedia, Sorbus hybrida, Sorbus rupicola and Sorbus torminalis.Other speciel plants confined to the rocky terrain on Bornholm are Cotoneaster niger, Cotoneaster scandinavicus, Spergula morisonii and Vincetoxicum hirundinaria. Only a few species of plants can grow on the vertical cliffs. Among these are several species of ferns. On the rocks it is often the danger of drying out that determines the survival of the plants. Due to dessication it is often the north sides of the cliffs that most species of plants can be found. Here they are protected from the sun most of the day. 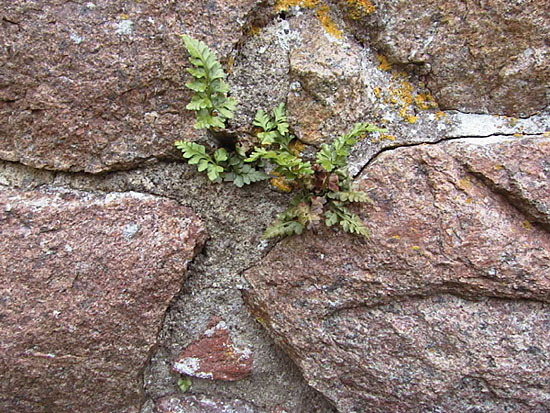 Asplenium adiantum-nigrum in the picture (on the ruins of Hammershus) is one of these ferns that can be found quite common in the rocky parts of Bornholm. Outside Bornholm it has only a few places in the rest of Denmark and often on old fences made of rocks. Other rare ferns on the cliffs of Bornholm are Asplenium trichomanes, Asplenium septentrionale, Cystopteris fragilis and Polystichum aculeatum. Common species as Polypodium vulgare and Dryopteris filix-mas one can find everywhere on the cliffs. Many other species of plants can be found on the cliffs and one of them is Draba muralis. This species has its only danish site on the cliffs in the protected valley "Døndalen". Back to Cliffs in the northern parts of Bornholm.